Stylish, light, and water-resistant, this reclaimed netting tote protects your stuff and provides jobs. Most commuters know the buzzkill of coffee or traffic-blackened slush splashing onto our stuff. This large, water- and stain-resistant tote safeguards belongings in style. Featherlight, yet virtually indestructible, its touch of modern industrial chic is 100% authentic: the "fabric" is netting remnants reclaimed from factories. 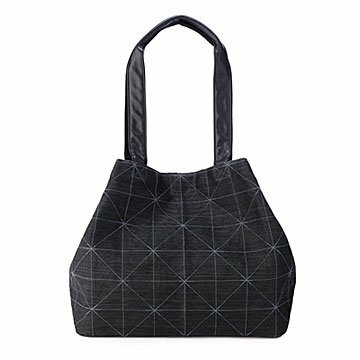 Rather than heading to a landfill, it's sewn into totes with a uniquely cool look. Inside, there's a sturdy, reinforced bottom, key strap, and one pocket each for phone and wallet. Clip it together and you have a go-anywhere purse. Unclip and it's a large sturdy bucket bag. Most of its Cambodian makers are hearing impaired, polio or landmine survivors, or moms who used to be trash pickers. They get training and fair wages in a safe working environment, while proudly making ultra-craveable bags. Vegan leather handles. Choose black or grey. Handmade in Cambodia.